TOUR/NEWS: Guineafowl tour and EP announcement! That’s right! 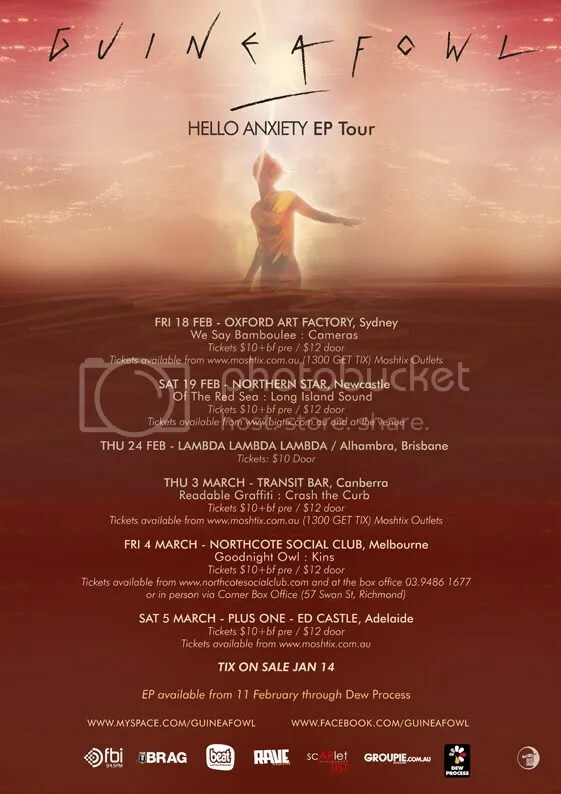 One of my favourite Aussie indie acts Guineafowl are touring in support of their Hello Anxiety EP, and you better be damn excited. Guineafowl first amazed me with the hand-clapping and plucked subtleties of “Botanist”, and since then have gone on to awe me with the delays and pounding beats of “In Our Circles”. This is a band that I’ve been wanting more from for a long time, and finally it’s going to happen! On the 11th of February, Guineafowl’s debut EP Hello Anxiety is going to be available through the lovely folks at Dew Process. Not only that, but a week later they will begin their tour in support of the EP, and if you’re lucky enough they’ll pass you by. It’s only $10-$12 entry! If you’re near any of these dates, be sure to check them out. Guineafowl will hit it big, you watch.